The Hiller YH-32 Hornet (company designation HJ-1) was an American ultralight helicopter built by Hiller Aircraft in the early 1950s. It was a small and unique design because it was powered by two Hiller 8RJ2B ramjet engines mounted on the rotor blade tips which weigh 13lbs each and deliver an equivalent of 45 h.p. for a total of 90 h.p. Versions of the HJ-1 Hornet were built for the United States Army and the United States Navy in the early 1950s. 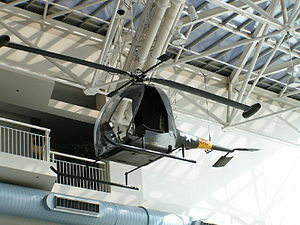 The Hiller Museum identifies the YH-32A, named the Sally Rand, as the first helicopter gunship. The Hiller HJ-1 Hornet was an early attempt to build a jet-powered helicopter using ramjets. Before that there had been experiments with the XH-26 Jet Jeep tip rotor pulse jets. The HJ-1 ramjet tipped rotor propels the rotor and the aircraft. Unlike a conventional helicopter, this mechanically simple design avoids the need for a tail rotor. Unfortunately, the tip speeds on helicopter rotor blades are subsonic, and ramjets are inefficient at subsonic speeds due to low compression ratio of the inlets. Therefore, the Hornet suffered from high fuel consumption and poor range. Also, the vehicle suffered from low translational speeds, and the ramjet tips were extremely noisy. In the event of power loss, autorotation was found to be difficult due to the drag from the ramjet nacelles. The vehicle exhibited powerful lifting capacity, and there was some hope for military uses, but the high noise, poor range, and high night-time visibility of the ramjet flames failed to attract sales. The HJ-1 was evaluated by the United States Army as the YH-32, and the United States Navy as the XHOE-1. In 1957 two YH-32s were modified as the YH-32A for trials as armed helicopters. All the fibreglass cockpit fairings were removed and the tail was modified. The tests were successful in proving the viability of the helicopter as a weapons platform, but due to marginal performance, no further conversions or orders were placed. Also, versions were sent to the U.S. Army's DRC to be evaluated in one of their contests involving the research and development of a light weight, air droppable helicopter for air rescue and reconnaissance, and for a portable, easily put together, and fuel efficient 1 man observation and transport copter. It was competing against the Jet Jeep and its pulse jets. Overall the YH-32 won out over the Jet Jeep, but the concept was considered obsolete, and later the program was canceled. United States Army, Similar to HJ.1 with two small v-shaped stabilizers, 14 built (2 prototypes and 12 production aircraft). Two YH-32s modified for trials as an armed helicopter. Three HJ-1s for evaluation by the United States Navy in 1951. 138652 – XHOE-1 on static display at the Udvar-Hazy Center of the National Air and Space Museum in Chantilly, Virginia. 53-4663 – YH-32 in storage with the Classic Rotors Museum in Victorville, California. 55-4965 – YH-32 in storage at the United States Army Aviation Museum at Fort Rucker in Ozark, Alabama. 55-4969 – YH-32 on static display at the Museum of Flight in Seattle, Washington. 55-4973 – YH-32 airworthy at Fantasy of Flight in Polk City, Florida. c/n 15 – YH-32 on display at the Classic Rotors Museum in Ramona, California. Unknown ID – HJ-1 on static display at the Hiller Aviation Museum in San Carlos, California. Unknown ID – YH-32A on static display at the Hiller Aviation Museum in San Carlos, California. ^ a b c d Andrade 1979, p. 121. ^ a b Andrade 1979, p. 195. ^ "H-32." Flight, 21 March 1958, p. 396. ^ "Tip-Jet Rotor Helicopters." Aerospaceweb.org, 14 September 2003. Retrieved: 30 January 2012. ^ a b "Hiller XHOE-1 Hornet". Smithsonian National Air and Space Museum. Retrieved 18 March 2017. ^ "Airframe Dossier - Hiller YH-32 Hornet, s/n 53-4663 USAF, c/n 2". Aerial Visuals. AerialVisuals.ca. Retrieved 24 March 2017. ^ "Airframe Dossier - HillerH-32 Hornet, s/n 55-4965 US Army". Aerial Visuals. AerialVisuals.ca. Retrieved 18 March 2017. ^ "Military and Civil Helicopters Displayed at American Heroes Airshow June 20". The Museum of Flight. The Museum of Flight. 10 June 2009. Retrieved 18 March 2017. ^ Bogash, Robert. "Seattle Museum of Flight Restoration Center". Retrieved 18 March 2017. ^ "1956 Hiller Hornet". Fantasy of Flight. Fantasy of Flight. Retrieved 18 March 2017. ^ "Airframe Dossier - HillerH-32 Hornet, s/n 55-4973 USAF, c/n 13, c/r NX125JC". Aerial Visuals. AerialVisuals.ca. Retrieved 18 March 2017. ^ "FAA REGISTRY [N125JC]". Federal Aviation Administration. U.S. Department of Transportation. Retrieved 18 March 2017. ^ "Hiller H-32 Hornet". Classic Rotors. Retrieved 18 March 2017. ^ "Airframe Dossier - Hiller YH-32 Hornet, c/n 15, c/r N3955". Aerial Visuals. AerialVisuals.ca. Retrieved 18 March 2017. ^ "Aircraft on Display". Hiller Aviation Museum. Hiller Aviation Museum. Retrieved 18 March 2017. Andrade, John. U.S. Military Aircraft Designations and Serials since 1909. Hinckley, UK: Midland Counties Publications, 1979. ISBN 0-904597-22-9. Apostolo, Giorgio. The Illustrated Encyclopedia of Helicopters. New York: Bonanza Books, 1984. ISBN 0-517-439352. Display information at Museum of Flight in Seattle, Washington. Wikimedia Commons has media related to Hiller YH-32 Hornet.